The KT-21 Express is a dual-SIM GSM mobile phone featuring 2.8-inch Capacitive Touch Screen, sports a 3.2 MP rear Camera with LED Flash and 16 GB of internal memory with expansion up-to 32 GB via microSD slot. Special features of Karbonn KT-21 Express includes T9 keypad, Smart Mail (a Push Mail service comprising popular mail services), PIN-based Karbonn Instant Messenger (KIM) to chat free of cost, NexgTV application allows users to watch 50+ Live TV Channels. Connectivity option includes Bluetooth with A2DP, GPRS, WAP, and EDGE. Other features includes 3.5 mm Universal Audio Jack, FM Radio with recorder, proximity and motion sensors, Mobile Tracker, Multi Format Video Player and Recorder, Hindi language support and is equipped with a standard 1000 mAh battery. 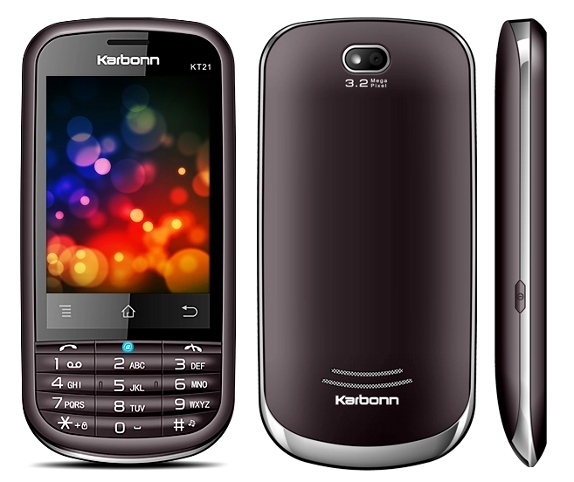 The Karbonn KT-21 Express is available for Rs. 4, 490. Tags:Karbonn KT-21 Express, KT-21 Express, Dual -Sim, Touch screen, T9 keypad, Karbonn KT-21 Express features, Karbonn KT-21 Express specifications, Karbonn KT-21 Express review, Karbonn KT-21 Express details, Karbonn KT-21 Express availability, Karbonn KT-21 Express specs, Karbonn KT-21 Express images, Karbonn KT-21 Express pics, Karbonn KT-21 Express pictures, Karbonn KT-21 Express price.